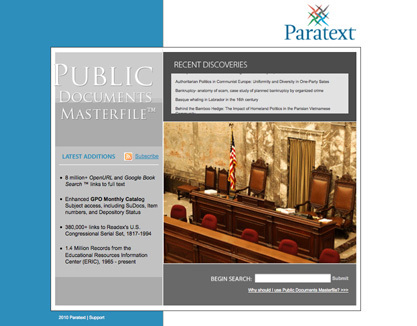 Paratext is pleased to report that you can now find a new, introductory search portal when accessing Public Documents Masterfile. This new landing page makes it easy for you to join our RSS feed to keep up with new content updates and other information related to Paratext products, provides your users with a basic description of the service, and offers a reminder of the variety of subjects and fascinating information included in the index via our scrolling discovery bar. This is part of our ongoing effort to keep Public Documents Masterfile the most comprehensive resource for finding the government documents you need–online or on your library shelves. If you have yet to see the value Public Documents Masterfile can add to your library, contact us for a free 30-day trial of the service.